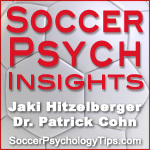 Welcome to episode 3 of Soccer Psych Insights, your soccer psychology podcast! On this episode, Jaki Hitzelberger, MA and Dr. Cohn answer a question from a soccer player who asks, “How do i move on from frustration after mistakes?” Jaki and Dr. Cohn help you understand how to manage perfectionist expectations, move on from mistakes, focus in the moment, and avoid letting frustration hold you back from performing your best. Mistakes are a part of soccer and because the best athletes accept this, their performance does not suffer after a few mistakes. Listen to this episode of Soccer Psych Insights to learn how to improve your mental toughness, confidence, focus, and composure in soccer. If you have a question for us, please visit our contact page and submit your question, we will do our best to answer your question in our soccer psychology articles or on Soccer Psych Insights.